Waukesha, WI, June 2005. Once again, DMG's Managing Partner, Ron Davis, was invited to keynote the Wisconsin Burglar and Fire Alarm Association's annual awards dinner. Davis' talk on the emerging trends in the alarm industry focused on acquisitions and mergers. In a deviation from previous talks, Ron focused on trends that were impacting independent alarm dealers as they contemplate various strategies. The talk gave members, whether they were interested in buying, selling or remaining just the way they were, how they could plan for the future and what strategies would be taken. Davis was given recognition for his work with the association and thanked for his contributions with a plaque presented by association president, Mike Horgan. 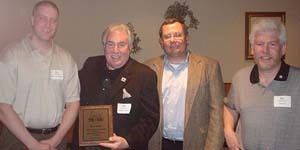 Ron Davis pictured receiving an award from the Wisconsin Burglar and Fire Alarm Association President, Mike Horgan (left). Mike said of the Davis presentation, "We are honored to have somebody of Ron Davis' status speaking at our convention." Ron Davis welcomed two former members of the Wisconsin Burglar and Fire Alarm Association, Roy Longworth and Bob Kerman, who came to hear his keynote presentation. DMG staffers, Bev Davis and Katie Bally charmed association members at the WBFAA meeting in June.